The calendar helps you get organized and spend less time scheduling your week. You can display records from different Apps in one centralized view. The calendar can be accessed by clicking the calendar icon in the top navigation bar. To get started you need to select the Apps which you want to display in the calendar. When you click 'Add more' you can tick the Apps you want to display. A maximum of 12 Apps can be shown simultaneously in the calendar. 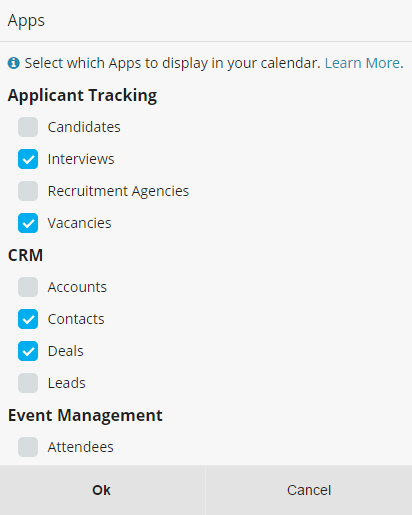 When an App is added to the calendar, a 'Link to User' Field in that App is used to filter the records displayed. The Users selected here will determine which records are displayed in the calendar based on the 'Link to User' Field selected for each App. When you choose the 'Unassigned' option, all records which have no one assigned in the 'Link to User' Field will be displayed. In most cases, when you add an App, the settings are selected automatically. However you can still configure the settings yourself. Just click on the icon to configure the App settings. 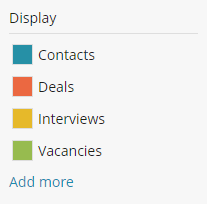 Date Field: This setting is used to know where records will be placed in the calendar. In the image above we have chosen the Next meeting Field for the Contacts App. This means that if the next meeting scheduled for 'Contact A' is on the 17th of June, 'Contact A' will be displayed on that date in the calendar. 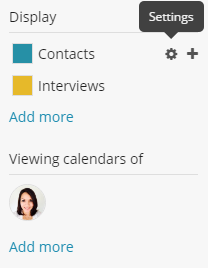 Link to User Field: This setting is used to filter the records which are displayed in the calendar. In the image above we have chosen the Responsible Field for the Contacts App. 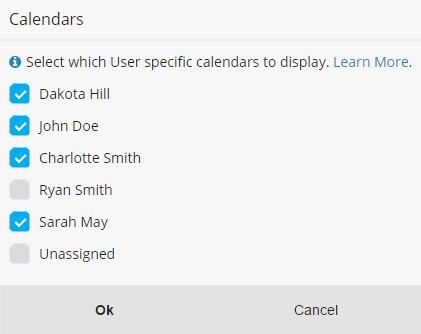 Therefore, if we take the example used earlier, only the Contacts where Dakota Hill is selected as responsible will be displayed in the calendar. 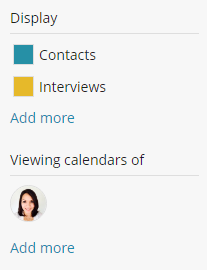 To display Contacts where other Users are responsible, you have to add those Users to the 'Viewing calendars of' section. 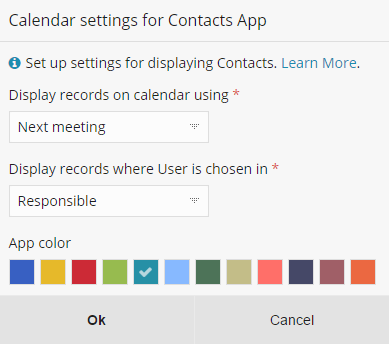 App Color: This will determine the color which is used to represent the App in the calendar. When the App added to the calendar has at least one custom Link to User Field and one custom Date Field, the App settings are set automatically. If multiple Link to User or Date Fields are available, the first one according to the Field sequence in the App is chosen.